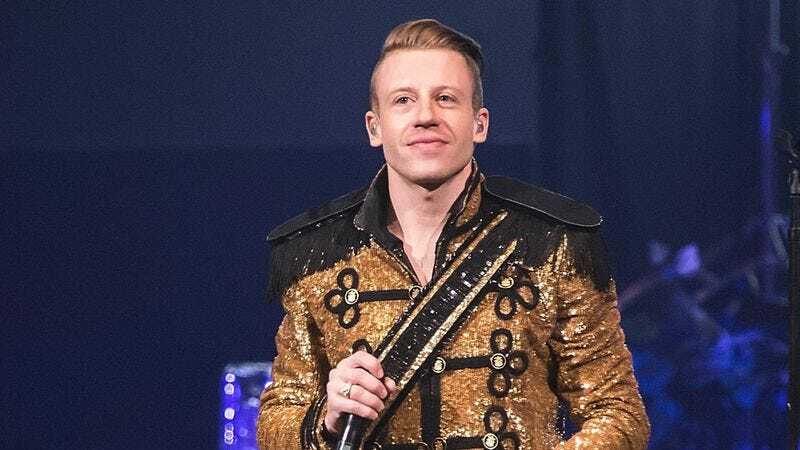 LOS ANGELES—Immediately following his performance Sunday night at the 56th annual Grammy Awards, Seattle-based rapper Macklemore politely reminded audience members at the Staples Center that he had CDs and other merchandise available for purchase in the lobby. “Make sure to drop by and see us after the show, because we’ve got CDs, posters, decals, and I think T-shirts, too, if we remembered to bring them,” the recipient of seven Grammy nominations said while gesturing toward a small folding table near the rear of the auditorium and noting that he was currently running a deal of $10 for one CD or $15 for two. “Ryan [Lewis] is over there right now, and I’m about to go join him, so please stop by and say hi. Also, don’t forget to sign our mailing list, if you haven’t already! Thanks, everybody.” At press time, sources reported that Macklemore and Lewis were explaining to a customer that while they weren’t set up to take cards, they did accept cash and would be glad to make change for a 20.